While the average education attainment is improving in the U.S., the improvement is not necessarily uniform across the entire population. In a recent paper published in Demography, SRC research assistant professor Fabian Pfeffer showed a large and increasing gap in college attainment by family wealth. Previous research has documented the relationships between education outcomes and a variety of socioeconomic background variables, such as parental education, occupation, and most notably, family income. Although some people consider income and wealth conceptually similar, Pfeffer argued that income and wealth are different for the purpose of studying education outcomes. Namely, inter-generational transfers, which account for an increasing proportion of wealth in the U.S., imply that wealth is not merely the accumulation of income through an individual’s life cycle. There are several reasons why inequality in wealth would lead to inequality in education outcomes. The wealth distribution is more unequal than the income distribution in the U.S. Wealthier families can afford to spend even more on education. Additionally, given that public education is funded mostly through property taxation, increasing wealth inequality not only leads to economic segregation of neighborhoods (through sorting in the housing market) but also results in economic segregation of school districts. And finally, with the rising college tuition, household wealth also acts as an “insurance”: children from wealthy families are more likely to be shielded from the burden of student loans and budget limitations. Using data from the Panel Study of Income Dynamics (PSID), Pfeffer showed two sets of results. First, the results are consistent with the hypothesis that higher household wealth is positively correlated with education outcomes, and kids from higher wealth quintiles achieve better outcomes than kids from the lowest wealth quintile. The results also suggest that income and wealth affect education outcomes independently from each other. Second, Pfeffer also assessed the cohort trends by comparing the educational outcomes of children born in the 1970s against those born in 1980s. 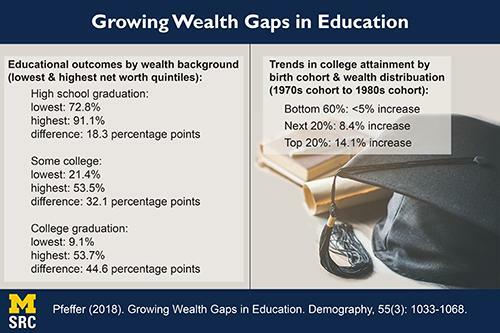 He found that, although the rate of high school completion and college enrollment has been increasing across the wealth distribution, college persistence and completion rates have been increasing more rapidly for children from the top of the wealth distribution. Pfeffer further addressed the two channels through which that increasing wealth inequality leads to an increasing gap in college attainment. First, the wealthiest 20% have pulled away from the rest of the wealth distribution. Everything else being equal, higher family wealth is associated with higher college attainment rate; the fact that the highest quintile is accumulating more wealth would lead to higher college attainment among children who grew up in wealthy families. Second, and more importantly, the relationship between family wealth and college attainment itself has become stronger, which reinforces the first effect and increases the wealth gap in college attainment. In order words, education inequality increases not only (and not chiefly) because of the widening wealth gap itself but also because of the growing importance of wealth. Overall, results from Pfeffer’s paper shed new light on the importance of household wealth on education outcomes. He also noted that, despite the sizable associations shown in his paper, only a small proportion of the increase in wealth inequality in education can be attributed to the increase in wealth inequality itself. The finding that wealth is playing a more important role in college outcomes calls for policy responses to ensure equitable college opportunities. Pfeffer (2018). Growing Wealth Gaps in Education. Demography, 55(3): 1033-1068.